And here's the Paula Jones crew from the morning of July 28. 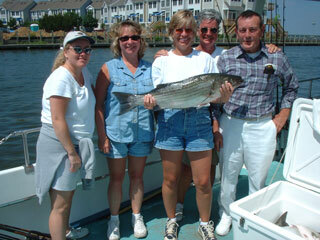 They caught a bunch of bluefish, some stripers and one awesome trout. 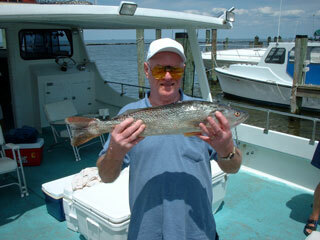 Here's Bob with a 26 inch seatrout. And here's the Augie Winterstine crew from the afternoon of July 27. 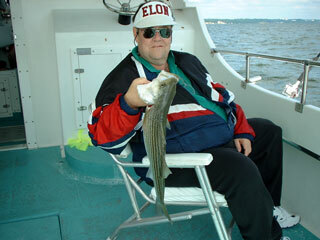 Augie and crew caught a good bunch of blues and some stripers, but the croaker fishing was off that night. 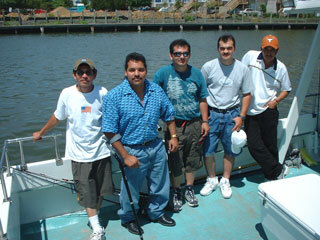 On July 22 Mike Fox (not shown) from North Bay Distributors hosted a crew from Westport Corp. for a day on the Bay. From left to right, that's Randall, Oscar, Luis, Alfredo, and Douglas. 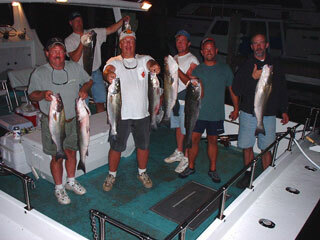 Bluefish and spot were caught by all crew members. 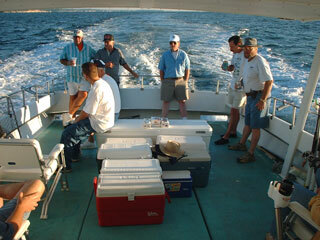 From SRA here we have a large crew led by Bill Wasner (center on the cooler). 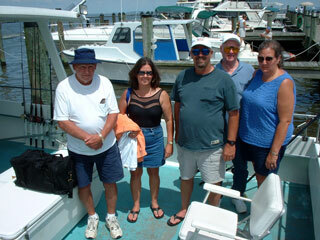 A good catch of bluefish on July 21 was followed by a side trip to the spot fishing grounds. And here we have the Earle McDonald crew from July 20, showing off their largest rockfish. From left to right, that's Lori, Cindy, Karen, Sandie, and Ed. 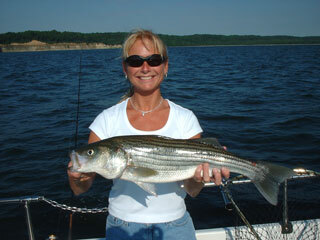 Here's Earle, leader for the above crew, with a nice rockfish he caught while trolling. 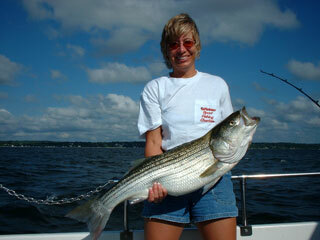 But Karen stole the day with her trophy, a 34 inch beauty. 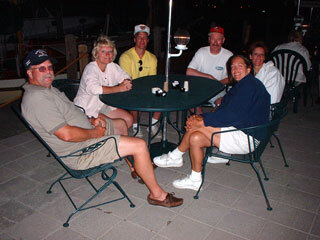 And Happy Birthday to Bob Crist (3rd from right) who chose to spend July 15 with friends "riding the Worm", catching fish, and having a good time. Click here for more trip photos. 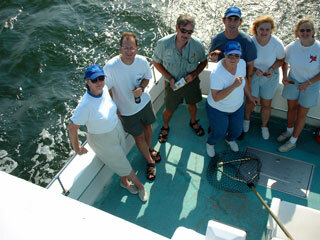 And here's a crew from D.C. Materials, led by Pete Babbs (far left at the stern). After catching loads of bluefish on July 14, we switched over to rockfish but they didn't cooperate very much. 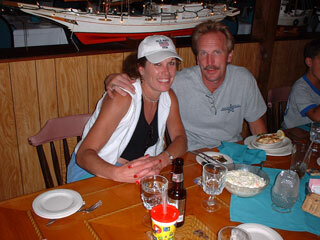 So off we went to Harrison's Seafood Restaurant on Tilghman's Island for lunch. Thanks Pete! 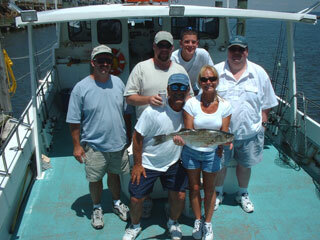 Here's the Dino Dipaola crew of July 13 with Dawn holding the largest rockfish of the day. Great catch Dawn. A picture is worth a thousand words, and what more can we say. And here's the Art McCrea crew from July 11 (should have played 7-11 at Keno...). 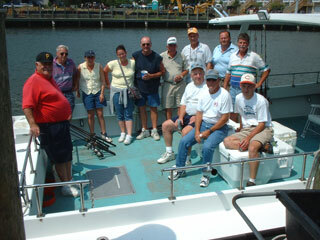 From left to right (standing), that's George, Mike, Terry, Brittany, Harry, Billy Art, BJ, Don, and on the cooler, John, Bob, and Jay. 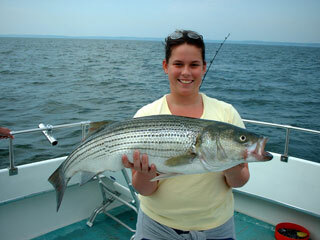 And Brittany won the pool for the day with a beautiful 36 inch rockfish, quite a catch for mid-July in our area. And here's Mike Fox and part of his dinner crew at Harrison's on Tilghman's Island, after catching limits of stripers on a really rough afternoon. Click here for more photos. 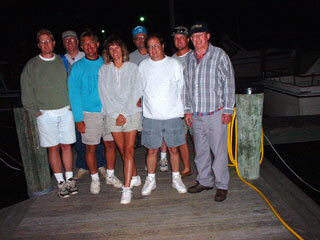 And here's the Jim Scott crew from July 6 with their limits of stripers. From left to right behind young Jeff, that's Joe, George, Diane, Jim, and Todd. Good catch guys. And here Captain Drew is entertaining international travelers on July 4. Crew members included Winnie, Doug, twins Drew and Ryan Martin, Cindy and Jorge Domostoy from Harrisonburg, VA, Juan Martiniuk, Mayor Alvaro Lamas and wife Nilda from Paysandu Uruguay, South America, Jonathan from Waldorf, and twins Joshua and Justin.